Niles Haymer, a lawyer for defendant Ronnie Anderson, says the answer is no. He released copies Tuesday of his new motion to have Anderson’s case moved out of state court in the city of Clinton, where a Confederate monument stands outside the East Feliciana Parish Courthouse. But that same judge also threw out a serious firearms charge against Anderson. District Attorney Sam D’Aquilla has now filed a new felony charge against Anderson, involving illegal possession of a stolen firearm. 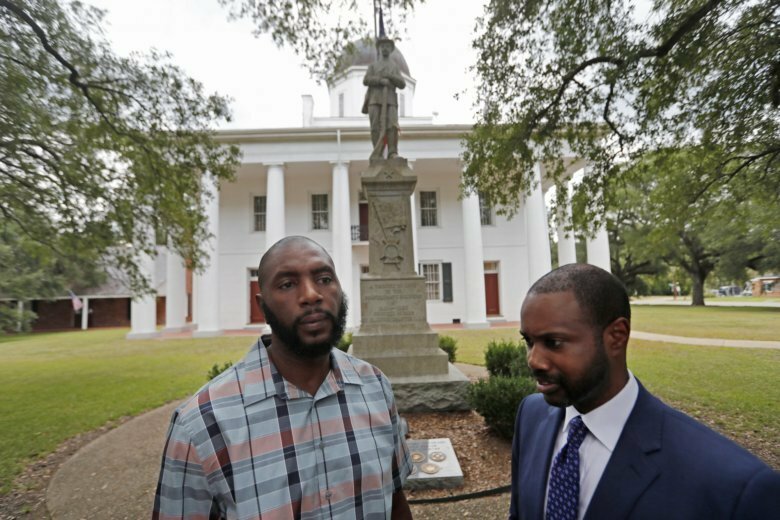 That gives Haymer an opportunity to renew his argument that the 30-foot-high (9-meter-high) monument — a soldier on a pedestal erected in 1909 during the Jim Crow era — signals that a black defendant cannot get a fair trial in East Feliciana Parish, which is about 30 miles (48 kilometers) north of Baton Rouge. “Defendant contends that this Confederate Monument is not just memorializing the Confederacy but revering the Confederacy and what it stood for, right in front of the very place that African Americans go to seek fairness and impartiality in the court system,” his motion reads. D’Aquilla confirmed in an email that he has filed the new felony charge. Asked to comment on Haymer’s new motion, he said he has commented in the past and his position hasn’t changed. Last month, he said it is “ridiculous” to think a statue would affect the fairness of Anderson’s trial. He said he doesn’t have an opinion on the statue, but regardless of whether it’s there the people inside strive for colorblind justice. A database compiled by the Southern Poverty Law Center lists 11 other Confederate monuments at Louisiana courthouses. In northwest Louisiana’s Caddo Parish, the governing body has voted to remove a Confederate monument from courthouse grounds. A lawsuit seeking to prevent removal is pending at a federal appeals court in New Orleans. Associated Press writer Rebecca Santana contributed to this report.